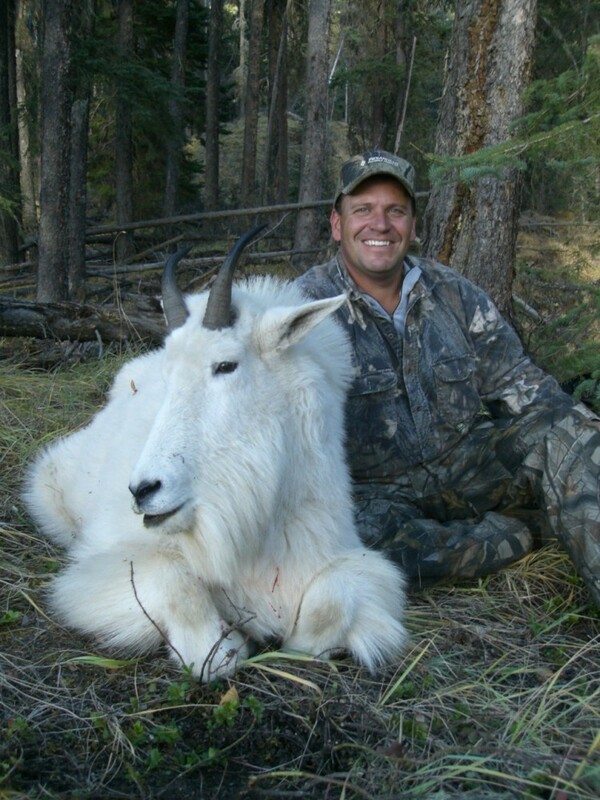 I love to surprise hunters and this story is my favourite mountain goat hunt story. In the early days of owning this hunting territory in British Columbia Toby Dutter had come on a moose hunt, during this hunt we took a drive into the mountains to see if we could find a bull moose with our binoculars. While we were there, we noticed a number of Mountain Goats on the mountains across from us. Toby turned to me and said that he would love to hunt them. Unfortunately our goat hunts where booked up for a number of years to come, but I kept that information in the back of my mined and was able to use it the following year. Toby was coming moose hunting in British Columbia the following year, he was going to be in our camp during his birthday and we just so happened to have a mountain goat tag available because a hunter had cancelled at the last minute. I purchased the goat tag for him with out his knowledge and put a plan in motion. When Toby got there I told him that I had a new spot to explore and he was the guinea pig. He rolled his eyes but as always he was willing and off we went. It was a long ATV ride through some excellent moose country but after a few hours we where there. Walking out on a rimrock looking at a gorge like valley Toby looked at me and said why are we moose hunting here!! He didn’t know but we had a population of mountain goats that lived in a river valley a long ways from the mountains. I told him we could see a lot of country and you never know. I proceeded to locate a good billie goat below us and once I put the spotting scope on it I tapped Toby and told him to take a look. When he bent over and looked at it he said “I would love to hunt mountain goat one day!” I pulled the mountain goat tag out of my pocket and handed it too him and said too bad we didn’t have a tag. It took a while for it to register but when it did you couldn’t have whipped that grin off his face. A well placed shot, short back pack, and long ATV ride back, Toby had a birthday Mountain Goat Hunt he will never forget.